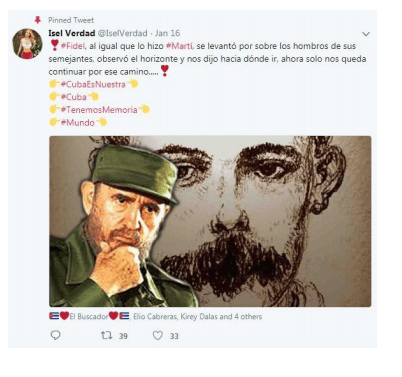 A Cuban-American human rights group has documented dozens of Twitter accounts, allegedly belonging to young Cubans on the island, posting pro-communist propaganda and using photos of actors and models as their photos. 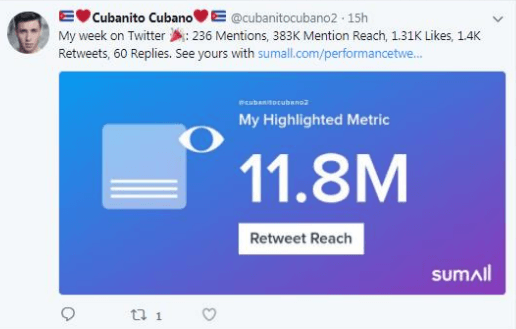 The Miami-based group, Directorio Democrático Cuba, says it has reason to believe the Cuban government is creating the spam accounts to make itself appear more popular among young Cubans than it really is. In stealing the identity of models and actors to make the pages more appealing, the accounts violate Twitter rules. 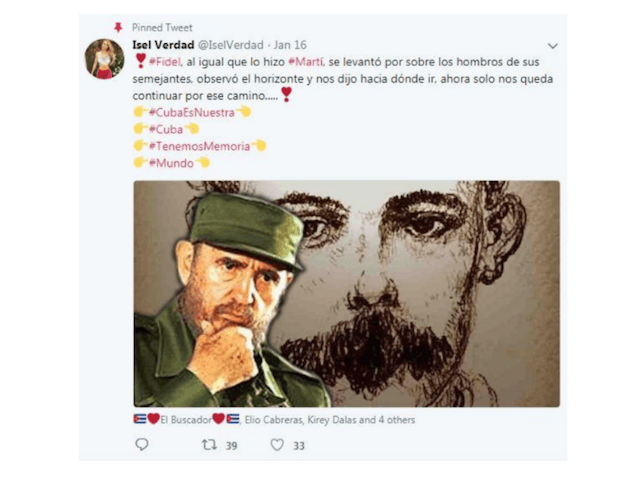 Since Directorio went public with its accusations, Twitter has suspended the accounts the group identified, though the Directorio team fears there are “hundreds” of such accounts that could easily resurface, especially if they are part of an organized state propaganda effort. The accounts used a variety of stock model photos as well as those of Italian dancer Robert Bolle, French model Arnaud Francois, Colombian actress Paola Rey, American actress Hayden Panetierre, Canadian fitness model Amanda Lee, Greek singer Sakis Rouvas, and Argentine actor Pablo Heredia. In some instances, the profile photos appear to be lifted off of the defunct social media pages of private citizens. 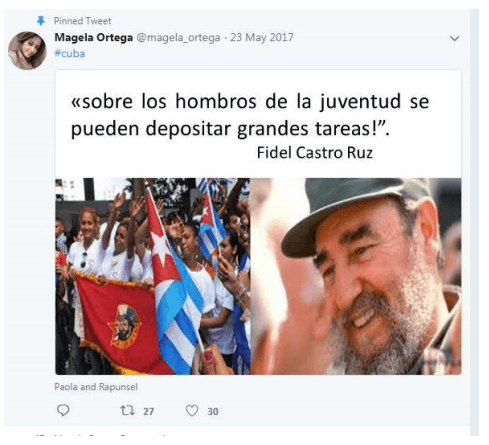 The account @magela_ortega, for example — currently suspended — used a photo lifted from an idle MySpace account. The profile using Rouvas’ photo — a two-time Eurovision contestant, former Eurovision program host, and the premier act in Greek popular music for the past two decades — identified itself as René Barrios García and promoted Cuba’s allegedly upcoming national election, in which the Castro regime has prohibited all opposition candidates from participating. 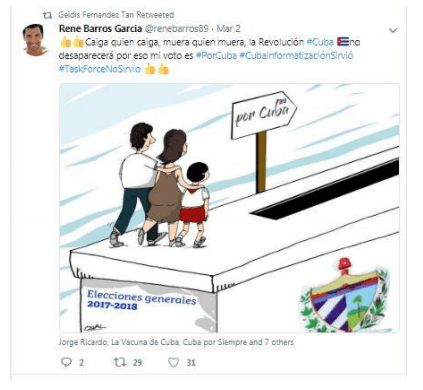 “Let the chips fall where they may, let whoever dies die, the Cuban Revolution will not disappear, that is why my vote is #ForCuba,” the account published. The account also posted anti-American content. This post reads: “The Summit of the Peoples, called as a parallel event to the Summit of the Americas in April, is convened to confront the onslaught of the United States and the continental right who want to use the event for their own means.” Nicolás Maduro, the dictator of Venezuela, was dramatically disinvited from the Summit of the Americas for his government’s human rights abuses. This account also boasted of its significant social media presence. According to Directorio, the accounts were all engaging with each other — liking and retweeting each other’s content. “We have tracked dozens of accounts like this, but we believe there are hundreds,” he added. 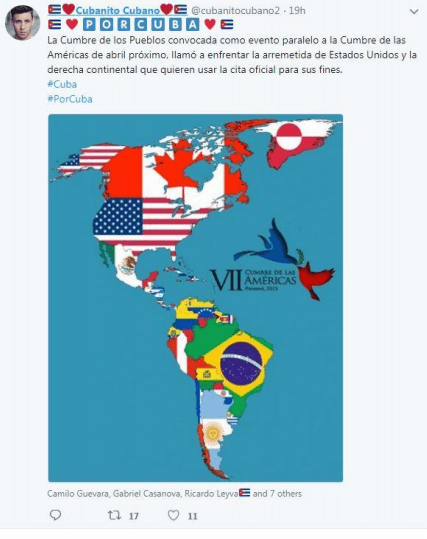 The implications of the Cuban government potentially creating hundreds of bots to spread propaganda not only aiding itself, but the Venezuelan rogue regime for Twitter could be of major significance. Twitter, as well as Facebook and other large social media outlets, already face significant scrutiny over concerns that the Russian government used similar tactics to influence the 2016 presidential race. In November, the outlet Politico reported that attorneys representing both media outlets confirmed that they have reason to believe “Russian-linked agents on their social networks following election day in November 2016 attempted to undermine President Trump’s victory” by “fomenting discord about the validity of [Trump’s] election.” The revelation conflicted with the ongoing claims by those on the left that the Russian agents were aiding Trump’s campaign, not hurting it. Twitter has responded to the criticism by deleting millions of accounts, including a significant number of politically vocal accounts that belong to individuals unaffiliated with governments. 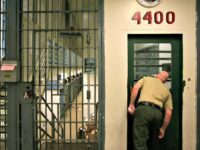 The removal of such accounts has disproportionately affected right-wing voices, while multiple accounts belonging to left-wing groups that advocate violence remain active. Prior to Directorio’s report on the pro-Castro accounts becoming public, the suspect pro-Castro accounts remained active. They appear to have been suspended between Thursday night and Friday afternoon. Gutiérrez applauded the suspension of the pro-Castro accounts.